For the past several decades, our expression and perception of what it means to live the Christian life have been shaped by what I call the salvation worldview. 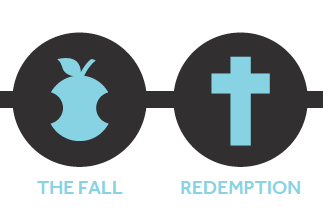 It says that the gospel begins with our sinfulness, brought on by the fall of mankind, and ends with our redemption by the sacrifice and resurrection of Jesus. So, living out the gospel fully means to understand and repent from our sinfulness and to accept the Lordship of Jesus and the salvation he offers. That process has been labeled “making a personal commitment to Christ,” or “having a personal relationship with Christ.” Sharing the gospel, in this worldview, normally is the act of pointing out another’s sinfulness, with the hope of “leading them to Christ,” where they will find peace, guidance and the assurance of a heavenly eternal existence in the presence of God once they die. All vital stuff. If this is the entire gospel, though, it focuses our existence as Christians on a few priorities: 1) the past acts of Jesus, 2) the condition of our souls and, 3) where we land – heaven or hell – after we die. How might this worldview shape the way we attempt to connect our everyday work with God’s mission? I would like your thoughts. Please respond and gracefully allow others to respond too!